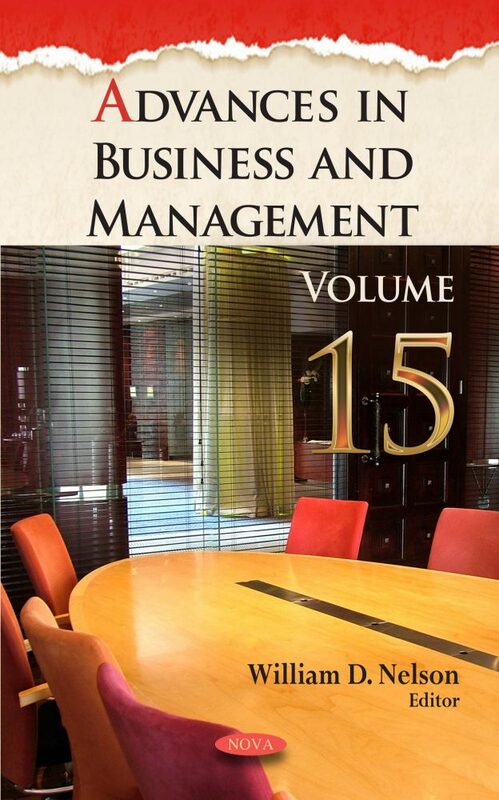 Advances in Business and Management. Volume 15 begins by presenting a paper examining the depth and range of psychological stressors and strains that entrepreneurs encounter in their new ventures, aiming to further clarify the confusion and inconsistencies of being self-employed. The following study was conducted in order to analyze the impacts of IT on e-business adoption and to understand the effects of quality IT strategies in e-business performance. Focusing on Chinese users through an online survey, the measurement instrument of this research model was developed from various studies. The authors go on to discuss brand management and the way in which it attempts to tap into collective meanings, associating life-world categories of thought and emotion. A seduction takes place whereby a captured emotional involvement with advertisements confuses the imaginary with perception and circumvents rational thought prior to purchase—all likely to evolve in directions anticipated by the market specialists. One paper shows that the manner an organisation approaches strategic planning is significant. A case study rooted in stewardship, service and divine endowments develops theoretical findings drawing from biblical strategy and blends these with contemporary strategic human resource management. Social impact assessment (SIA) has become a recent concept of interest within the business and public domains, soliciting further study by academics. SIA is an interdisciplinary social science that incorporates various fields and is regarded as a technique for predicting social impacts as part of an environmental impact assessment (EIA) or as a stand-alone process. This book contributes to the knowledge base of SIA and its relationship with b-corporations and integrated reporting, providing insights between these two fields of research. The penultimate current chapter embraces a topic which is still underdeveloped in the literature: how corporate social responsibility may or may not influence brand equity. Therefore, the authors conducted a literature review to analyse past studies on this topic, focusing on four major aspects. Today every customer is digital customer, and every enterprise is digital enterprise. It is proposed that the significantly changing business environment requires enterprises to rapidly change their structures, processes and systems in order to save their customers and to remain competitive and compliant to the requirements of the modern digital economy.